– It’s barely bigger than a regular wheelie bin, yet it takes up to 8 times the amount of litter. – It contains a regular wheelie bin, so it doesn’t require any special kit when it’s time to empty it. – It is fully enclosed in a smart steel box, so will never go walkabouts. – It knows when it needs emptying and will tell whoever is responsible for that itself. – It is powered by the sun. – It can provide a wifi hotspot. – It can make its owner money! 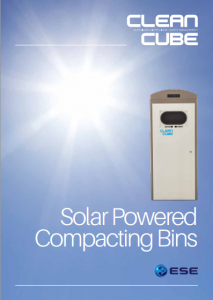 We are well aware that it isn’t the first solar-powered compacting bin to appear on the market, but that’s part of its appeal. Working with eCube Labs, we’ve been able to improve on what was already available and have created the perfect solution for high-footfall areas where large volumes of rubbish need to be managed. Now naturally, we are biassed. We think the Clean Cube could transform not just built environments, but also waste management and, with it, organisations’ operating costs. We are genuinely proud of what we’ve created and excited by the impact we see it having. So I can’t deny that a comment I heard about smart bins recently, threw me for a moment. The conversation was relating to the state of public parks at the end of a sunny day. You can picture the scene; overflowing, open bins with picnic rubbish including food waste (and the odd bag of dog poop) piled up around it. It’s a problem shared by every town and city in the UK and when you add a light breeze and a healthy seagull/fox/rat population, the problem reaches well beyond the confines of said park. “If you install a better bin, you are encouraging waste generation.” was the comment. Really? 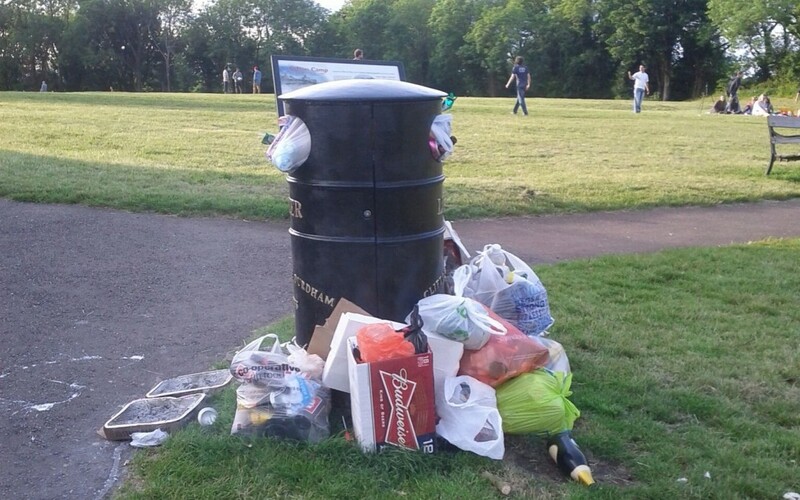 The reasoning was that in the moment someone (with litter to dispose of) sees a bin is full, they make a choice – between taking their waste away with them or leaving it by the bin. That I accept. But the scene I’ve described above is evidence enough that too many people choose not to take it away with them, but to leave it by the bin. And even if they take it home, the waste they’ve generated is still generated! It hasn’t magically disappeared. It’s just moved location. Unless of course the commenter is suggesting that somehow, a full bin signals an oversupply of waste which would trigger us as individuals to change our behaviour to compensate for the collective population! “Oh look, the bins are full. I’d better forgo buying a cartoned sandwich, a packet of crisps, a bagged flapjack and a can of coke for my lunch today.” thought no one ever, as they strolled through the park at the start of their lunch break. This isn’t a chicken and egg situation. There’s no confusion around which came first – the waste or the bin. Here’s the reality: we all of us create too much waste. I’m old enough (just) to remember the days before fast food takeaway joints and eating-on-the-move were a thing. Picnics were prepared at home and transported to the park in Tupperware, Thermos flasks and sturdy picnic bags – all of which came back home with us. Even tinfoil, were any involved, got smoothed out and reused. This is just how things were. Whether motivated by economic or environmental factors, frugal living and reuse seems to be on the up again which is great news for people and planet. But changing the behaviour and values of the throwaway society we’ve become since the 70s is going to take massive action. To reduce waste generation everyone involved needs to want to. The responsibility should not fall solely on consumers. Producers of packaged goods, those in charge of looking after our communal spaces – whether private or public, and those, like us who provide solutions to help them, we are all equally responsible for facilitating the change in behaviours needed to reduce waste. But that change is not going to happen overnight, so in the meantime, we need to deal with where we are right now. Let me finish with a question: if you walked through a park, at the end of sunny day and saw minimal litter because the smart bins provided had been designed to not only handle the quantity of waste currently being generated, but also keep it out of reach to seagulls, foxes and rats, would you be grateful for the help in keeping your environment beautiful, or think: ‘oh, no need to worry about my packaging choices anymore then.’? For more information about the Clean Cube, call us on 01530 277900. Or visit our Clean Cube microsite here.